PLEASE WATCH THE VIDEO LINK ON THIS PAGE. A New Ground Floor Ocean/Pool Front Condominium that is Just a Short Walk to the Boat Dock that Takes You to Some of the Best Marlin and Sport fishing in the World. 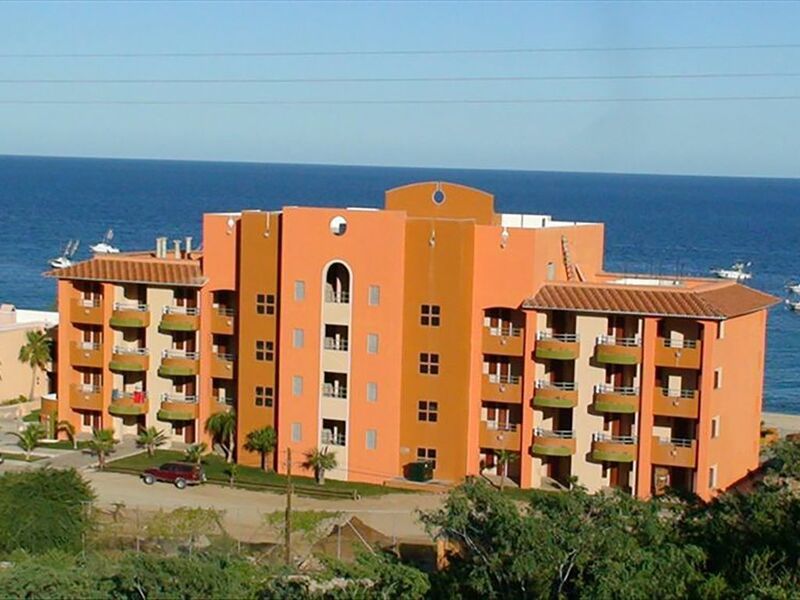 Located Just 40 Minutes North of the Los Cabos Airport on the Sea of Cortez in the Small Town of Los Barrilles B.C.S. A Quaint Friendly Safe Community Which Has Yet to Be Discovered by the Rest of the World and is Reminiscent of What Cabo San Lucas was Thirty Years Ago. The Villa is Sized Just Under 1200 Square Feet and is Divided Into Two Main Rooms (the Living Room & Master Bedroom) Which is Perfect for Families, Friends or Couples Wishing to Have Separate Sleeping Quarters and seperate bathrooms. The Master Bedroom King Size Bed, Super Comfortable Leather Sleeper Couch with Upgraded Mattress and Queen Sized and twin Auto Inflatable Air Beds Allow for up to a Six Person Stay. Beautifully Decorated with Amenities that Include Inlayed Travertine Floors, Granite Countertops, Flat Screen LCD TV'S with Surround Sound, a Subzero Refrigerator with Icemaker, Washer & Dryer, Designer Stovetop, and Stand Alone Wine Cooler. One of the only units with a built in oven which is a must for extended stays. The Dish Network premium package has HBO and Showtime in addition to the standard channels. This Master Suite Offers Wi-Fi Internet and Unlimited Vonage Long Distance Calls to the United States. De Cortez Resort Which Adjoins the Property and Includes Unlimited Services to the Facility for Your Stay Which Include Access to Mexico's Largest Private Sport fishing Fleet. Reward Yourself with a Massage at the Spa De Cotez or Visit the Gourmet Wine Cellar and Humidor for a Bottle of Wine or a Cuban Cigar. Take Advantage of the Exercise Room, Tennis Court, Driving Range, Golf Course, Restaurants, Bars, Sushi Bar, Ping Pong & Pool Tables. You May Rent ATV's, Wave Runners, Kayaks & Automobiles at the Front Desk. Dine on the Deck at the Authentic Mexican American Restaurant Just Outside Your Back Door. Experience Some Amazing Eco-Tours Such as Hiking to the Desert Waterfalls & Pools Near the Town of Santiago or Snorkel Over the Live Coral Reefs and Dive or Swim with Wild Sea Lions at Cabo Pulmo National Park. The ATV excursions to the waterfalls or snorkling just outside of town (90 minutes round trip) are a great adventure. You May Want to Just Relax at the Pool with the Swim up Cabana Bar and Watch the Sting Rays and Dolphins Jump from the Sea. Maybe Just Get a Cold Drink and Watch the Boats Return Proudly Displaying Their Various Colored Flags Indicating the Count and Type of the Fish They Caught that Day. The Local Smoke House Will Pick up Your Fish at the Dock and Clean, Fillet or Smoke it and Vacuum Seal Your Catch and Have it Ready for You to Pick up the Day You Depart. The Villas Offer a Gas BBQ So You Can Cook Your Fresh Fish and Dine Outside While Listening to the Surf and Enjoying the Cool Breeze as it Gently Blows Off the Ocean. The East Cape Area is Well Known for it'S Extreme Wind Surfing and Kite Boarding in the Winter Months. There is a Modern Full Service Grocery Store, Gas Station, Bank, Medical Clinic as Well as Both American and Authentic Mexican Restaurants that Are All Within Walking Distance from Your Front Door. Transportation from the Airport is Available with All the Major Rental Car Companies or a Driver Can Pick You up for Your Convenience. Keywords: The Villas de Cortez, Vanwormer Resorts, Palmas de Cortez, Baja Condominium, Los Barriles vacation rental, East cape Fishing, Marlin Fishing, Los Barriles, East Cape,Villas de cortez, Baja vacation rental, Tuna Shootout, Dorado Shootout, Baja windsurfing, Los Barriles, East Cape kite boarding, Baja vacation home, Los Barriles vacation home, East cape Mexico, Baja Mexico turtles. WE LOVE THE CHARM OF THE EAST CAPE AND ALL THE NATURAL BEAUTY OF THE SEA OF CORTEZ AND THE SURROUNDING DESERT. THE WORLD CLASS FISHING WAS WHAT ORIGINALY BROUGHT US HERE, BUT WE HAVE SINCE FOUND SOME OF THE OTHER ATTRACTIONS AND SITES ARE EQUALLY AS RELAXING AND ENTERTAINING. WE LOVE RIDING THE QUADS ON THE BEACH OR TO THE DESERT WATERFALL TO SWIM. THE VARIETY OF THE LOCAL RESTAURANTS WITH THEIR FRESH SEAFOOD OR ORIGINAL MEXICAN DISHES IS ALWAYS A WONDERFUL DINING EXPERIENCE. THIS PLACE HAS A NICE PACE TO GET AWAY FROM IT ALL AND JUST KICK BACK OR HAVE AN ADVENTURE DEPENDING ON YOUR MOOD. OUR VILLA HAS GREAT ACCESS TO THE POOL AND SURF FROM RIGHT OUT THE BACK DOOR. YOU ARE NOT REQUIRED TO TAKE THE STAIRS OR ELEVATOR EVERYTIME YOU WANT TO GO SWIMMING OR TO COOK ON THE BAR-B-QUE. THE ACCESS IS GREAT FOR KIDS. WE HAVE STAYED IN THE UPPER UNITS AND LIKED THE VIEW , BUT THE BALCANYS SEEMED VERY SMALL AND THE VIEW WORE OFF AFTER WE HAD TO HAUL OUR STUFF UP AND DOWN EVERTIME WE CAME AND WENT. WHEN A GROUND FLOOR UNIT BECAME AVAILABLE TO PURCHASE THE CHOICE WAS CLEAR. WE HAD OUR MASTER SUITE PROFESSIONALY DECORATED DOWN TO THE SMALLEST DETAIL. THEY SUPPLIED IT WITH EXPANSIVE AMMENITIES FOR US TO FEEL AT HOME DURING OUR STAYS AND NOT TO JUST THE BASIC ITEMS THAT ARE REQUIRED TO QUALIFY AS A RENTAL UNIT. IT'S ALL ABOUT THE SMALL DETAILS THAT MAKES THE DIFFERNCE. IT HAS ADVANTGES THAT WE HAVE BEEN TOLD ARE NOT FOUND IN OTHER UNITS AT THIS RESORT. PLEASE TAKE THE TIME TO COMPARE THE DIFFERNCE TO ENSURE YOUR STAY IS AS PLEASURABLE AS POSSIBLE. THE GOURNET KITCHEN OFFERS AN OVEN WHICH MOST OTHER UNITS DO NOT FOR SOME REASON. THE FREE LONG DISTANCE TO THE STATES IS GREAT AS WELL AS THE WI-FI INTERNET AND PREMIUM DISH NETWORK PACKAGE. 2 Bathrooms, Guest Bathroom has a shower, Master Bath has a tub shower combination with grab rails. Free Long Distance Calling to US and Canada Cordless phone. Corded local phone. Parking in front of the building or in the lot next to the building. Available at The Hotel Palmas De Cortez Next Door. Upgraded Dinerwear, Cuttlery, Wine and Tumblers, and amenities. Full Kitchen with upgraded amenities. An upscale Restaurant just outside our back door with a deck that overlooks the Sea of Cortez. "Ticos" for Breakfast & Lunch at The Hotel Palmas de Cortez which adjoins our property. Great Room: 4K TV, Apple TV, Bluray Player Master Bedroom: LED flat screen, DVD player Premium Dish Channels. In room DVD video library located in drawer under TV in Great Room. Snorkel Gear and fins have been available. No guarantee. Gated Pool Area. 2 Private Pools exclusive for Villas de Cortez guests. Our guests may also use The Hotel Palmas de Cortez Pools. Note: Pools are not heated. A great place to relax or go on an adventure. Or both. Would absolutely stay in this unit again. Loved being on the ground level with the pool right outside our sliding glass doors. So peaceful lying by the pool. Very short walk into town where there are numerous restaurants to eat at. La Casita was our favourite restaurant. Everything about our stay was perfect. The condo was clean and comfortable, and the staff was so friendly. We look forward to our next visit to the Villas and LB. This is our 4th time staying at Villa 1106 and as usual everything was perfect. Lovely place right off the pool. Each time we come to stay we thoroughly enjoy ourselves. Beautiful well equipped condo in a great location. Short walks into town and the adjacent restaurant is great. Accessing mountain biking trails was awesome and a breeze to get to. Super fun watching the fishing boats come in everyday from the deck! Loved it! Thanks for your kind review. We are glad you enjoyed your stay. We appreciate that you decided to stay with us. Please remember us with your future adventures. We really enjoyed the villa, it had everything we needed. Having a heated pool would have been a plus, we were there 9 days and never saw anyone in the pool because the water was too cold. Hopefully that can be upgraded in the future, it would make the property perfect! We used Fernando for airport transfer he was wonderful, very prompt, polite and easy to get a hold of. We used Candoo rentals for a UTV for the week and had a great time, able to park right in front of the villa and pop out onto the beach right next to the building. We felt very safe throughout our stay. We did have to go to the hotel front desk to get some additional trash bags as we didn't have any in the room and we picked up a few extra rolls of paper towel at the grocery store. Other than that we had plenty of supplies in the kitchen. I will note that if anyone plans to use the Keurig coffee maker they will need to bring some k-cups from home. We couldn't find any at Chapitos or any other stores in town. We just made regular pots of coffee everyday which supplies were available for that in the room. Most of the neighbors were very friendly, a few (who may have been renters) seemed to think the pool area was an extension of their villa and would leave personal items outside (chairs, towels, toys, books) for days at a time. Overall we really enjoyed our stay and hope to come back again. Great location has everything you need only negative is the sofa bed it’s impossible to sleep on. Thanks Magnus for the review. We have a additional mattress for added comfort for the sleeper couch under the king size bed. We will provide this information in our welcome letter as a reminder when you stay with us again. World class marlin & sport fishing, Mexico's largest private sport fishing fleet next door at world famous Palmas de Cortez. ATV rentals, snorkeling/diving, car rental, eco-tours, wave running, Desert waterfall tours, Airport transportation. Shopping/restaurants/grocery within walking distance. American clinic/banamex bank/modern gas station/hardware store.